SAN FRANCISCO – L’Oreal USA, which has built its brand on glamour and global beauty, sells cosmetics made with chemicals linked to cancer, including eye makeup, children’s shampoos, nail polish, and more, according to research conducted by the Campaign for Safe Cosmetics. In a letter to L’Oreal USA President and CEO Frederic Roze, the Campaign for Safe Cosmetics requested that L’Oreal make a public commitment to eliminate carcinogens from its personal care and cosmetics products. The Campaign targeted L’Oreal as part of its “Cosmetics Without Cancer” campaign to pressure the world’s cosmetics giants to stop using chemicals linked to cancer. L’Oreal is the largest cosmetics and beauty brand in the world, worth $14.5 billion, according to Forbes. “There’s nothing glamorous about cancer chemicals in eye makeup. For decades, L’Oreal has used the tagline ‘Because I’m worth it.’ The Campaign for Safe Cosmetics is asking L’Oreal to show its customers that we’re truly worth it by eliminating cancer chemicals from its cosmetic products, including shampoos, lotions, and makeup,” said Janet Nudelman, director and co-founder of the Campaign for Safe Cosmetics. Over the summer and fall of 2014, the Campaign for Safe Cosmetics consulted a number of digital cosmetic databases to research the presence of carcinogens in cosmetics and personal care products manufactured by the world’s largest multinational cosmetic companies and then Campaign staff verified findings by reading product labels. Our investigation of L’Oreal products revealed the use of chemicals linked to cancer in its eye makeup, as well as anti-aging creams, nail polish and hair products made by L’Oreal brands Maybelline and Garnier. Maybelline’s iconic Great Lash mascara, easily identified by its pink and green packaging, lists the chemical Quarternium-15 on the label. Quaternium-15 releases carcinogenic formaldehyde, which is used to preserve the mascara. L’Oreal’s Kids 2-in-1 shampoo contained another formaldehyde-releasing chemical, DMDM hydantoin. Other companies, including Johnson & Johnson, have removed formaldehyde-releasing chemicals from children’s products. Talc (in inhalable form), which can be contaminated with asbestiform fibers in L’Oreal eye shadows and Maybelline blushes and pressed powders. Consumer demand for safe cosmetics is changing the marketplace. According to industry analysts, natural cosmetics reached $30 billion in global sales in 2013 an increase of 10.6 percent. This trend is due in large part to growing consumer concerns about toxic chemicals in cosmetics. L’Oreal is the second target of the Campaign’s Cosmetics Without Cancer Campaign. In October, the Campaign called on Procter & Gamble (P&G), the nation’s largest maker of personal care products, to remove carcinogens from its products. More than 100,000 people sent letters or signed petitions asking Procter & Gamble to take immediate action to eliminate cancer-causing chemicals from its brands including Cover Girl, Max Factor, Pantene, Olay, Herbal Essences, and Miss Jessie’s hair products. Due to an outdated and weak federal law regulating the safety of cosmetics, none of the cancer-causing chemicals identified in L’Oreal products have been banned – or are even restricted – for use in cosmetics in the U.S., despite the fact that all have been identified as carcinogens by respected, scientific authoritative bodies. A legislative proposal to give the U.S. Food and Drug Administration’s more statutory authority to regulate cosmetics, including banning cancer-causing chemicals, was introduced in the House of Representatives by Rep. Jan Schakowsky (D-Il) in 2009, 2011 and again in 2013. 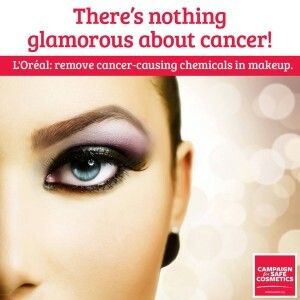 TAKE ACTION: Tell L’Oreal: Cosmetics With Cancer Chemicals are Not So Glamorous!